Some of the most valuable items we own are often kept in an outbuilding such as a shed in the garden or a garage. Such items often include things like bicycles, lawnmowers, expensive tools and other valuables that you might have put away into storage. In some cases people put their musical instruments, gym equipment or home entertainment systems and cinemas in a shed or garage, which has been converted into a recreational activity area. You may even have a pool house or a sauna built into the garden, and often these structures cost a lot of money. Aside from the structure, the valuables inside can make outbuildings like a shed or garage very costly to repair or replace if anything were to happen to them, making them very important to insure. Firstly, if you already have home contents insurance and buildings insurance then you will need to check the terms and conditions of your policy to check what aspects of your shed, garage or outbuilding are protected. Secondly, then you can see how much extra protection to pay for. If you do not have any insurance or only home contents insurance but not buildings insurance, then you should read on to learn more about the types of insurance policies and level of cover available to protect the structure and contents of your garage, shed or outbuilding. 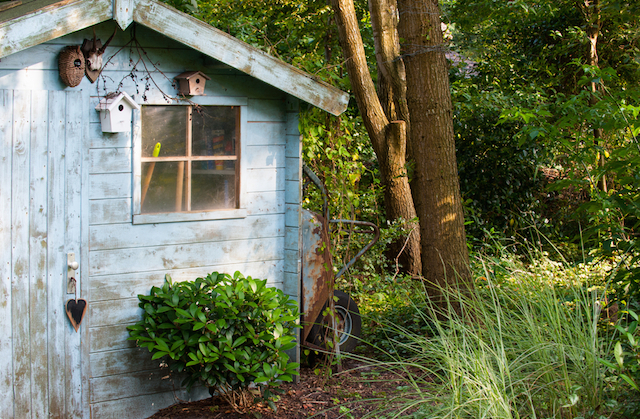 Is my shed or garage covered with my home insurance? To fully protect your shed or garage or any other kind of outbuilding on your property, you will need to get home contents insurance as well as buildings insurance. Buildings insurance provides cover on the structure of the property against fire damage, flooding and most other unforeseen damages. The structure of the property is defined as the bricks, walls, roof and fitted kitchen and bathroom. It also includes the structure of garages, sheds and any other outbuildings listed in the insurance policy. Home contents insurance provides cover on your possessions up to a certain value against theft, fire damage and flooding – and for an extra fee, accidental damage. If the possessions that you want to insure are above the value agreed in the home insurance policy then you will need to pay extra if you want to properly insure it. Read our guides to buildings insurance and home contents insurance for more information. Most types of buildings insurance policies and home contents insurance policies will protect outbuildings such as a garage or shed in your garden. These structures are often classed as the ‘fixtures and fittings’ aspect of the buildings insurance cover. If you have home contents insurance then the contents inside a garage or shed will also be covered, but there are many exceptions to this rule and most insurers are wary about insuring any valuable items you keep locked away at night outside of the main property building. Even if you have both kinds of home insurance there are still many drawbacks to the level of cover you are likely to receive on your garage or shed, so it’s important to look at the terms and conditions of your policy and be prepared to make improvements to the security and structure of your outbuilding. For example, if a tree fell on to the roof of a shed in your garden, which caused the structure to collapse and also damage many of the contents inside, then the payout you received might not be substantial enough to fully restore the shed and replace the items. This is because there is generally more risk to insuring outbuildings such as garages and sheds. The materials are not often as resilient as the materials used in your home and thus are more at risk of being damaged by the elements. As a result the contents inside the shed or garage carry a higher risk, therefore insurers are unlikely to be as generous with their pay out on a stolen or damaged lawnmower in the shed, as they would be on a stolen or damaged television from the house. However, there are measures you can take that could go some way to improving the chances of keeping your contents safe and your outbuildings secure. In doing so, you might find that insurers are more willing to take more of a chance on fully insuring your shed or garage and give you a better deal on your premiums or even cover you for higher valued possessions. How can I lower the cost of garage or shed insurance? Many home contents insurers will have a separate pot of money they pay out from when it comes to the damage or theft of items in a shed or garage. This could range anywhere between £500 and £3,000. However, if you do make a claim on any theft or damage to items in a garage or shed your home insurance provider is likely to be more cautious about paying out and enquire about the level of security you provided on your outbuilding. For example, if you had items stolen they will want to know if the shed or garage had a proper lock on it and will want proof of forced entry. Outbuildings such as sheds and garages can be easier to break into because of less security provided, so by investing in better security you could lower the cost of your premiums and get better cover from your home insurance provider. Some items will not always be covered or they will expect it to be secured further even within a secured shed or garage, such as a bicycle. A bicycle might be covered up to a certain amount but many insurers will expect it to also be locked up inside a locked shed or garage. If there was no lock on it at the time they might be less comfortable about paying out the full amount. Read our guide to bicycle insurance to learn more about protecting your bike on your property and away from home. Similarly, if your shed was built several years ago and is generally in poor condition, then if you make a claim because a flood or a falling tree destroyed it, the insurer may not think it was worth the amount you paid for it in the first place. There are many different rules when it comes to insuring your home and any outbuildings you have, so be sure to read through all of the conditions before buying any home insurance or taking out extra cover. Find a home insurance policy that protects your valuables whether they’re inside the home or locked up in a shed or garage.